When you walk in, this is the first view you get of the ruins! 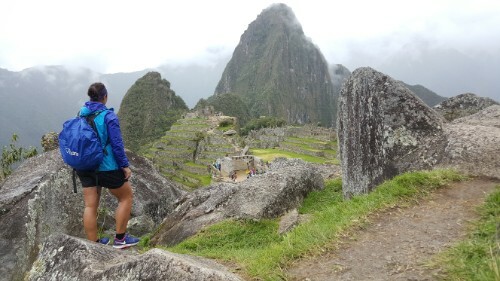 When my Machu Picchu day finally came along, I had mixed feelings. 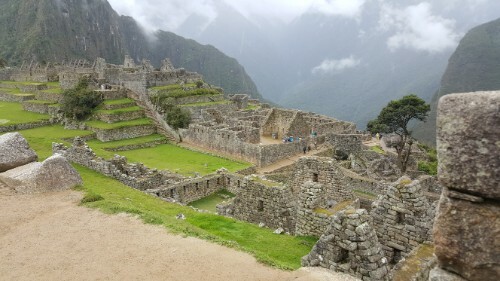 On one hand, of course I was beyond excited to visit the place I had been looking forward to seeing ever since I decided to go to Peru. On the other hand, it’s nice to have really exciting things to look forward to, and sometimes the “looking forward” is almost better than the “actually doing”. That probably doesn’t make any sense… let me try again. When you finally go somewhere or do something that everyone has raved about, aren’t you ever nervous that the idea of it will be better than the actual thing? That it’s been talked up so much that the reality can’t possibly match your expectation? There was a part of me that feared that. Like maybe I’d find myself facing one of the wonders of the world and manage to not feel impressed. SO COOL SO COOL SO COOL!!! 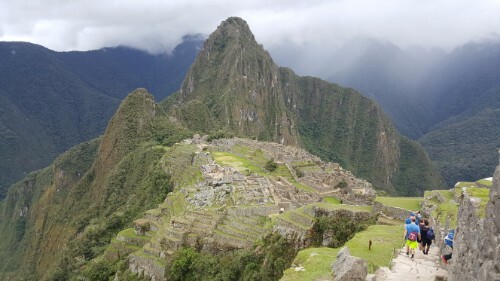 Lucky for me, the experience of visiting Machu Picchu is partly indescribable. No matter how much people told me about it, they couldn’t convey the wonder I’d feel when seeing the huge expanse of beautiful ruins set against a backdrop that’s straight out of a fantasy. No matter what I write about it, I promise you that I can’t even begin to do it justice. 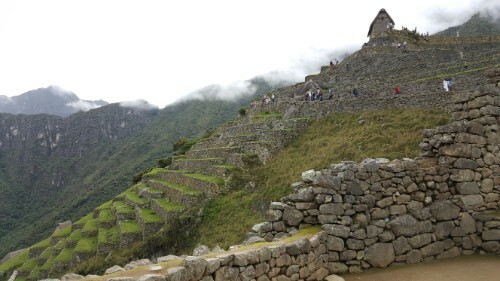 Even without the air of mystery that surrounds the history of Machu Picchu, it’s baffling. When you add in the questions about how it was constructed, what everything was used for, and where everyone disappeared off to, it becomes even more marvelous. There’s nothing better than a good mystery! This picture is confusing and kind of seems like it should be rotated… but this is right. I promise. 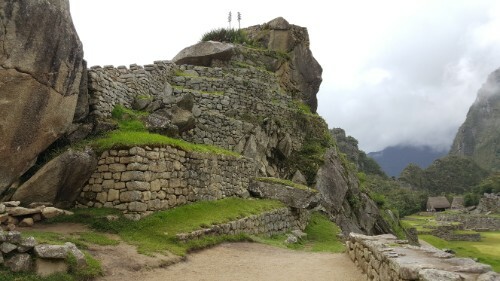 The Inca Bridge is at the bottom of the light rocks on the left. 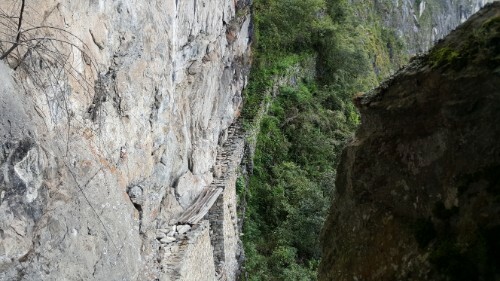 See the gap in the rock path and the boards that are placed across it? 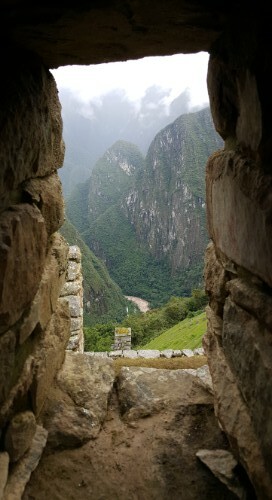 The Incas could move the wood to block off this entrance into Machu Picchu if they ever needed to. On my hike back to the main part of the ruins… I just couldn’t stop taking pictures! 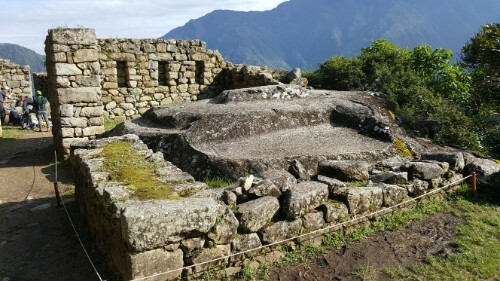 Archeologists have concluded that the site was an estate for one of the Inca emperors, which means that it was basically a full city on top of the mountain. About 1000 people could live there, but they think that 5x that number was required to build it. Also, they’ve only recovered the skeletons of about a quarter of that. 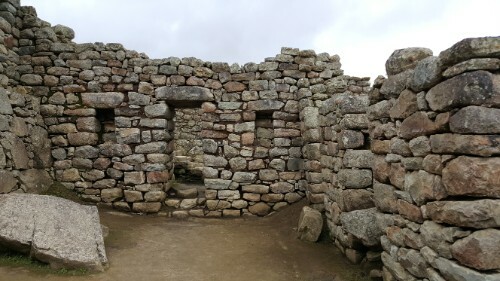 The stone is a type of granite that was taken straight from the site, and they don’t use any mortar to hold it all together. Question #1: How was it constructed? The site is way bigger than I realized. I think that’s what everyone says after they go, and even though I’m telling you that right now, you’ll say the exact same thing if you go. 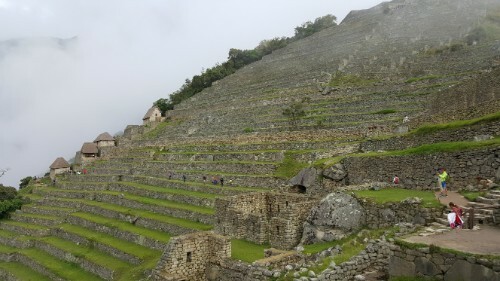 There’s the main part of the town that you always see in pictures (which even that is bigger than you realize… all of those pictures are taken from quite far away), but then there are terraces EVERYWHERE that were used for growing crops. Carving out the terraces, cutting, moving, and putting together the millions of rocks, and building a town of that size must have taken an eternity. The methods they used for cutting rocks so precisely and moving the big ones around are still somewhat unknown. It would be an amazing feat even if it WASN’T on top of a mountain, but it is. Oh yeah, I didn’t mention that you have to take a half hour bus ride (or a 1-1/2 hour hike) up the mountain from the town. It is not located for ease of access. 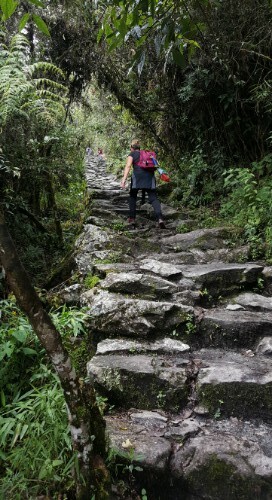 There are also pathways that wind through the surrounding mountains. There’s no way the full extent of them is even known because at this point, the unexcavated ones are buried under almost 450 years of plant growth. Let me just say that there’s a reason why one of the theories of its origin is aliens. It’s so fantastic that aliens start seeming like a realistic explanation. Okay, this one was a mini-tripod/self-timer picture. There was no one around to take it, really! I’m standing in the quarry area. Like, does this even look real? Question #2: What was it used for? Archaeologists have general ideas about the site as a whole and the functions of some of the different buildings, but for the most part, it’s just speculation. 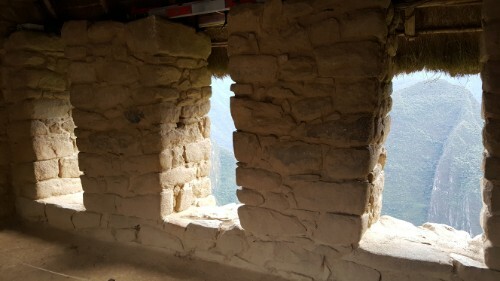 If you hire a guide while you’re there, they’ll tell you all sorts of things about what this rock means and why that room has 5 windows and 4 niches, but the truth is that not much is known for sure. There are a lot of assumptions, but there are so many questions that it makes you wonder how much you can trust them. I decided to skip the guide and take my sweet time wandering through the buildings, making up my own stories as I went. I did have a guidebook which was nice because it helped to draw my attention to some of the more interesting features, but I still got to move at my own pace and just soak in the wonder of it all. Did I already take this picture? Yes? Ehh… I’ll take it again just in case. The view from my window… I wish! Question #3: Where did everyone go? 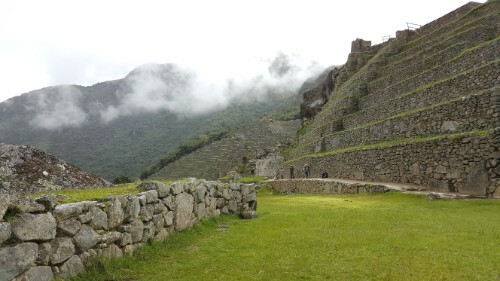 When the Spanish invaded in the mid-1500s, they took out much of the Inca civilization. 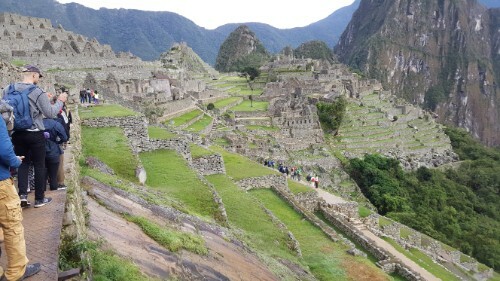 However, they never made it to Machu Picchu. 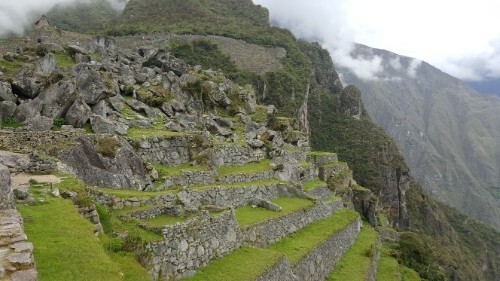 Its existence wasn’t brought to the attention of the general public until 1911 (it was looted by a few German explorers, and some local farmers knew about it and were even farming on some of the terraces prior to that year). So what happened to all of the people? Did they all go to fight in other locations? Did they just die out eventually? Smallpox is one guess. Imagine for a second if whatever did happen hadn’t, and there were still people living there when it was stumbled upon. They certainly had the food resources and planting strategies that they needed to survive. How cool would that have been? The more important buildings had more precise stonework, though none of the buildings used mortar so they were all pretty darn precise. 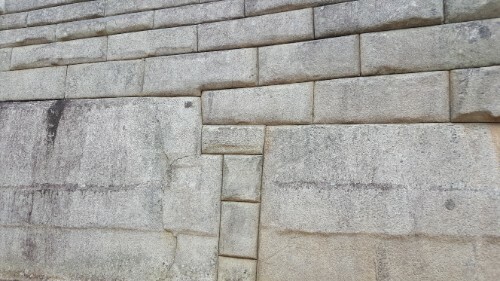 These though… How on earth do you get such tight joints with such massive rock pieces? Anyway, those are the three main mysteries that I allowed myself to mull over as I wandered around and tried to make sense of it all. I didn’t start out wandering the ruins though. 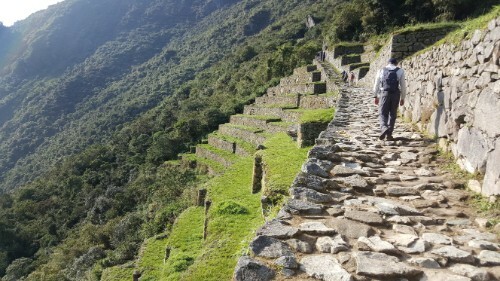 First, I walked up a pile of stairs to look over the site and get that iconic Machu Picchu view. 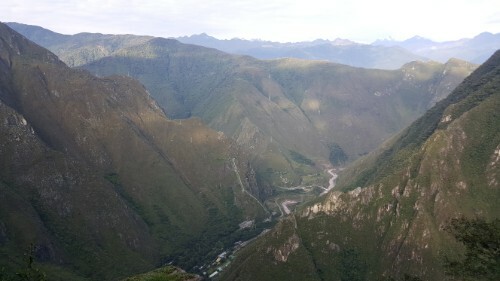 From there, since I was already halfway up, I did two of the hikes that are included in the entrance ticket, one to the Sun Gate, where the people who hike the Inca Trail enter the site and watch the sunrise, and the other to the Inca Bridge, a piece of wood terrifyingly placed across a big gap in the rock path that winds around the mountain. You can’t walk across it anymore because someone fell off and died, and after seeing it, that doesn’t surprise me one bit. More like why did they ever let anyone walk across? 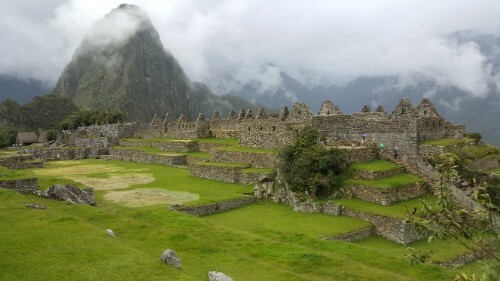 The classic Machu Picchu picture. I actually asked someone to take this, rather than using my usual mini-tripod/self-timer technique. 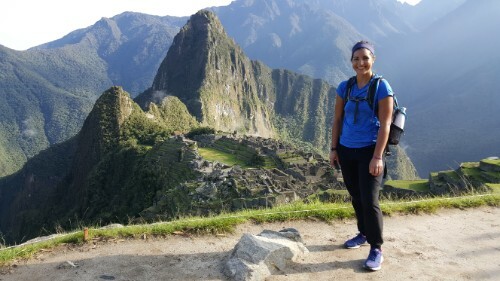 My big hike of the day was up Machu Picchu mountain. 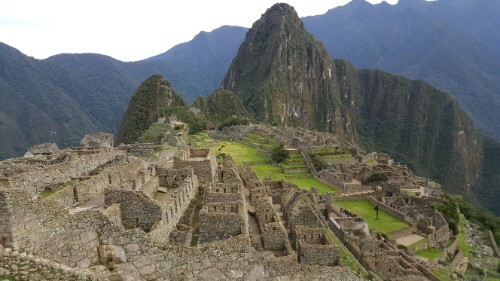 Nothing at Machu Picchu, including the place itself, is called by its Inca name. 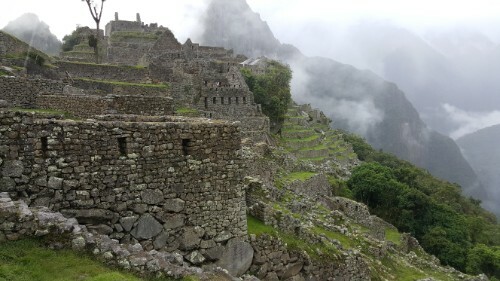 No one knows the Inca names. Machu Picchu is the Quechua name for the mountain next to the town, so when it was “discovered”, the explorer just called it by the same name. All of the buildings and such that are named were named by him. So like I was saying, everything is complete speculation. 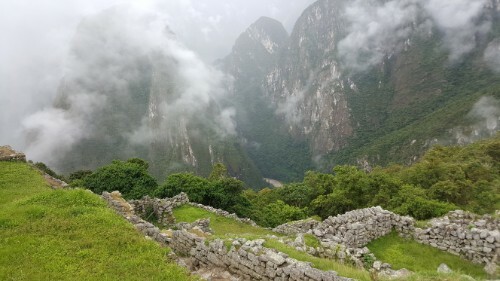 Anyway, I bought a separate ticket to hike Machu Picchu mountain, one of the two mountains next to the site. 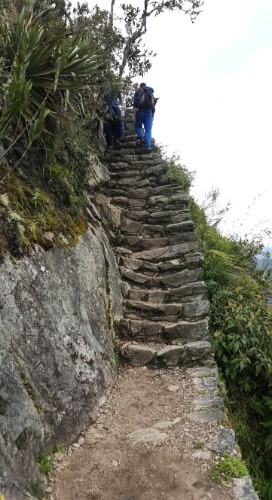 The other one, Huayna Picchu, is shorter, but the hike is more of an adventure with ladders and precarious ledges. I decided to skip the death-cheating hike and save it for if I ever go back with a hiking buddy. 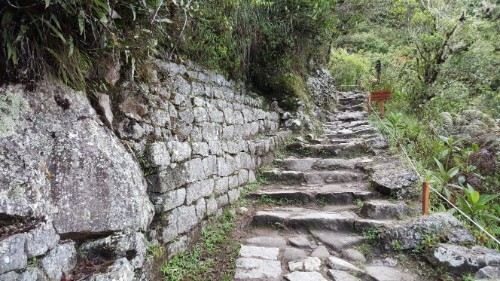 The hike up Machu Picchu mountain is just hundreds and hundreds of stairs. And more stairs and more stairs and these stairs that are so steep you probably want to use your hands too. Every time you turn a corner, you’re faced with another dead-end wall of rocks. Oh wait. Those are stairs. About 20 minutes in, I found a friend! She and I bonded over our pain and the fact that we were moving at similar speeds. I was thankful to have someone to struggle through it with me. The only thing worse than a super intense hike with minimal oxygen is a super intense hike with minimal oxygen where you don’t have anyone to complain to. 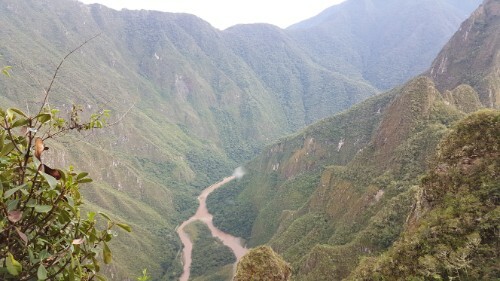 In hindsight, it was a definite mistake to do the Inca Bridge and especially the Sun Gate hikes before the mountain. I basically set myself up for failure because my legs were already tired when I started. MORE STAIRS???!!?? Yes. The answer is always yes. But I eventually made it! This is after about 45 minutes of relaxing at the top, which is the only reason why I’m smiling and not bright red. Anyway, I’ll spare you the quad-killing, air-gasping details of the hike and just say that it was an hour and a half of me strongly considering turning around and being fairly certain that the mountain was never going to end. 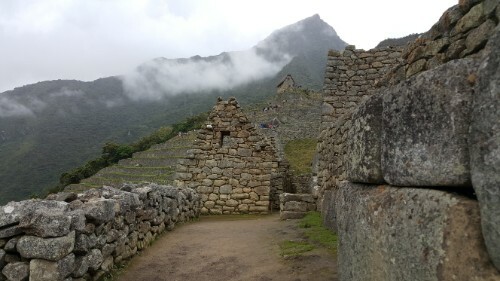 I got to the top just before the clouds blew in and completely obstructed the view of the ruins. 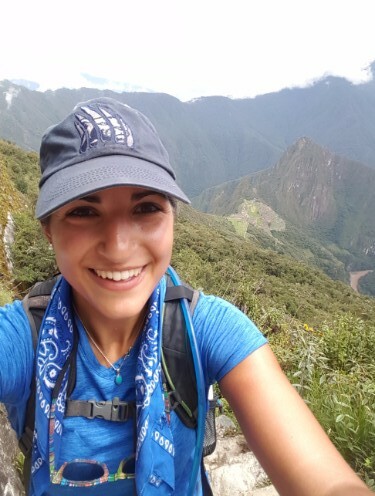 Can you think of anything worse than finishing that horrible hike and then not even being about to appreciate the view? I had about 20 minutes before we were sitting in a cloud. That’s all I needed though. I found a nice wall to sit on, ate some pretzels, and soaked in the awesomeness. Everyone gets booted off the mountaintop at noon, so I headed down through the clouds, a moment of rain, and back into the scorching heat. 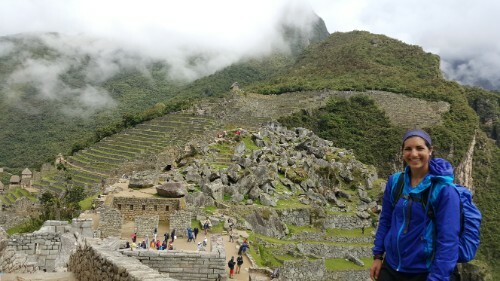 They say that you need to prepare for every type of weather when you go to Machu Picchu, and it’s true. I went in the morning wearing a sweatshirt and pants. I took my sweatshirt off early and changed into shorts on my hike to the Sun Gate. 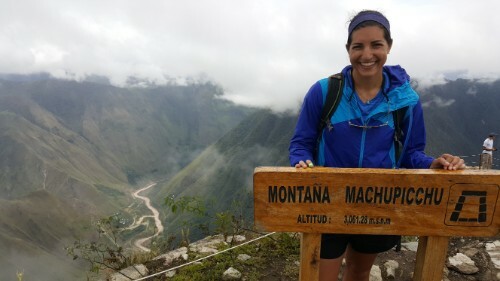 At the summit of Machu Picchu, it was freezing and drizzly, so I put my rain jacket on. Once I hiked down a little, it was hot again. 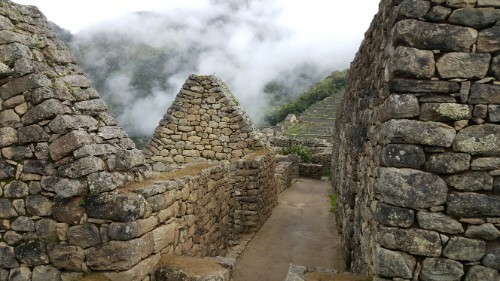 Then, in the afternoon as I was wandering the ruins, I must have put on and taken off my rain jacket at least 5 times as it rained and stopped and rained and cleared up and rained again. Me and my hiking friend with a very important rock that looks like some important animal but actually looks just like, well, a rock. I think this is hilarious. 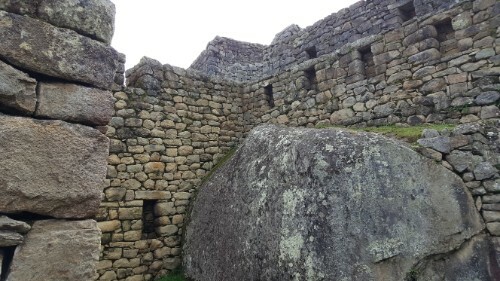 There are a bunch of places where there’s some ginormous rock that I imagine the Incas looked at and said, “LOL I’m not tryna move that!” (loose translation) So instead, they just left them in place and built the walls around them. The way they fit everything together is amazing no matter how many times I think about it. I spent the last couple hours of my visit exploring the ruins. 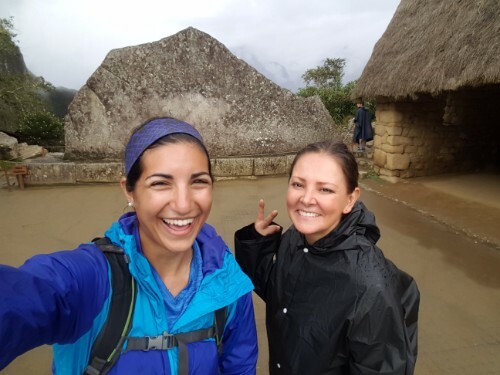 I reencountered my hiking friend, and we had fun walking around and making things up about the different ruins and their uses. Sometimes it’s nice to have a friend! It was especially perfect because she and I were on the same page about taking our time and wanting to see everything. Sometimes things work out so much better than you could have imagined! After finishing up at the site and heading back down the mountain to the town, we considered meeting up for dinner and ended up just showering and laying immobile on our beds at our respective hotels. I could have guessed that was what was going to happen. Can you imagine having this view every day? But seriously could it be any cooler? Sorry I can’t express myself any better but I’m sitting at my computer, days later, still geeking out over how amazing the whole thing is.